With the carrot of European integration hanging above their heads, Kosovo’s Prime Minister Hashim Thaci and Serbia’s leader Ivica Dacic finally reached a 15 point settlement on April 19th which regulates the relations of the two entities and provides for the decentralization of the police and justice structures in northern Kosovo. The list of those hailing the importance of this deal and the breakthrough that was achieved is quite long already. 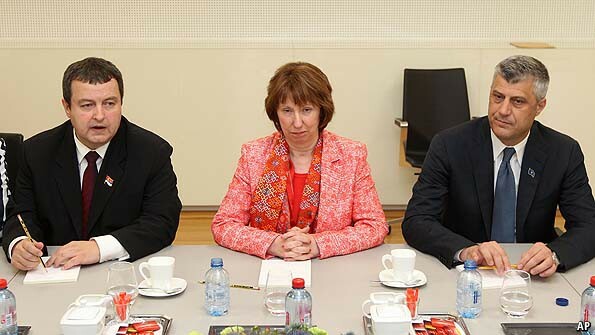 High Representative Catherine Ashton and the EEAS have received the acknowledgment that they desired for so long and criticism over the inadequacy of the Common Foreign and Security Policy will probably calm down for a while. Whereas the degree of implementation will demonstrate whether the agreement has been truly successful or not, it goes without saying that it is a substantial positive step towards normalization. EU’s diplomatic services performed following a ‘soft power’ approach and rarely resorted to restrictive methods; in this case the ‘stick’ was missing from the equation. Focusing on a different geographic area, but still remaining in the European neighborhood, another long standing unresolved dispute comes in my mind; the Cyprus problem. Leaving aside the issue of Kosovo’s declaration of independence, elements shared by the two disputes can be identified; the longevity of the conflict, the complex international arrangements that surround it, the securitization of ethnic identity that has been realized, the multitude of international and domestic actors involved. With the UN-led negotiations having reached a stalemate, and the offshore hydrocarbon explorations intensifying the level of the conflict, could the successful agreement between Kosovo and Serbia be an example for Cyprus and the unrecognized ‘Turkish Republic of Northern Cyprus’? Would the ‘carrot’ strategy of the EU diplomacy work in this case? The idea of a European mediation could be a good re-start to overcome the current impasse and provide further leverage to the EU as a conflict resolution agent. Part of the EU diplomatic success with Kosovo and Serbia was the fact that the agreement dealt with power sharing on a small territory. For Cyprus, a similar method might prove to be useful so that the negotiation process will stop stumbling upon complicated tradeoffs. But in recent years, the circumstances have changed for all sides of the negotiations. Cyprus, after surviving a tremendous collapse of its bank system, seems relatively comfortable with the current status and the institutionalization of the dispute to accept any substantial compromise. ‘TRNC’ is still far away from formulating a distinct policy strategy and is still heavily dependent on Turkey which seems to have lost much of its interest in joining the EU. In the case of Serbia-Kosovo, settlement came before accession; in the case of Cyprus, accession for the divided country is already completed and the ‘carrot’ of European accession for Turkey would have limited effectiveness. If the EU is genuinely concerned in the unresolved conflict, then I guess the obvious way would be to take advantage of the recent success in Kosovo and change the ‘carrot’ in a way that would attract the interest of both Cyprus and ‘TRNC’. Taking into consideration that almost everything has been tried, perhaps the ‘carrot’ is disguised as gas fields. The hydrocarbon findings in Cyprus’ Exclusive Economic Zone could reinvigorate the lost motivation and boost the economic growth in both sides. As the EU has made energy security one of its priorities there is still place for European involvement to this regard. In Kosovo, facing a highly skeptical international ambience, the EU has already impressed once; why not impress twice? This entry was posted on 03/05/2013 by ISIS Europe in Elena Marda, Opinions and tagged conflict resolution, cyprus, EU Foreign Policy, European Neighborhood, kosovo, Turkey.